If you want to move your business forward with velocity, you need to think Agile -- and be Agile. When you use an efficient Agile software development framework — which helps you produce your IT business goals more efficiently — you look to both your short-term goals, and your long-term needs, so you don’t get stuck reinventing the wheel. Very often there are a number of teams or business units working together — that’s good. But also very often in working together, good communication of important needs and interests is lost. Layers of designers, analysts, programmers, quality assurance, help desk, and others present opportunities to misinterpret a requirement or embellish a perceived need. 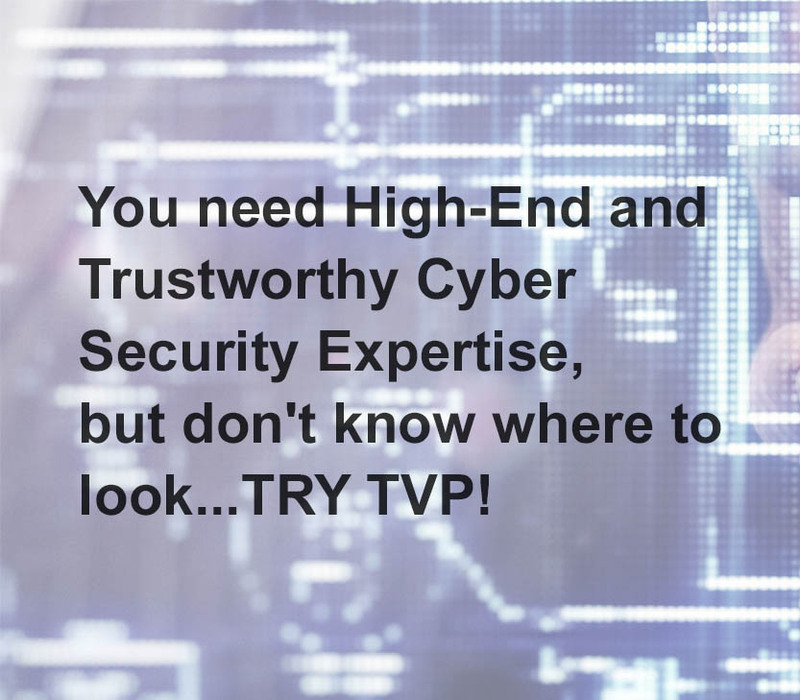 And if that happens, it certainly will muck up the development efforts of your IT teams and your end users. 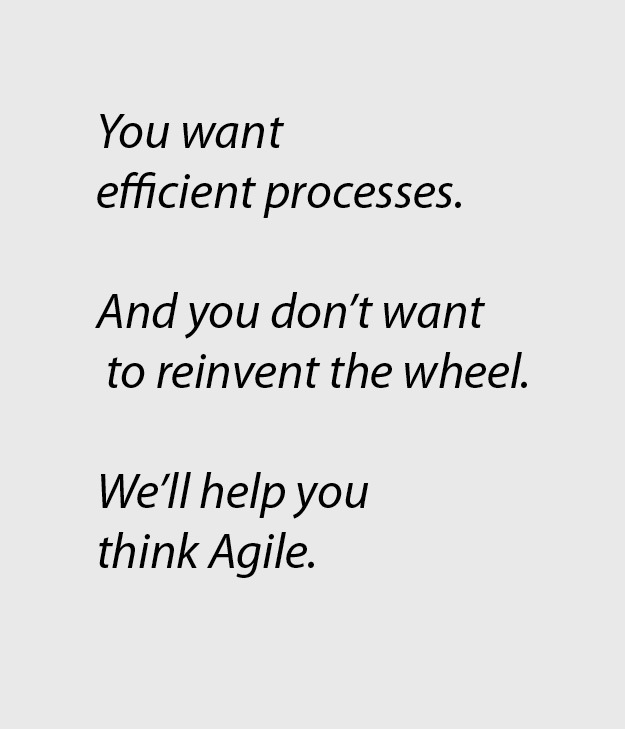 Agile consulting and working styles help us work efficiently for you. Getting through the confusion of communication and process that can gunk up your progress. Moving your game ahead with velocity. And we can help you get through your programs with Agile consulting…and train you how to be Agile…in a very different way than most companies. Do you want to be Agile? We can help your teams be leaders! As a proactive leader, you might want to have “efficiency” be part of your skillset, and built into the way your teams work, right? We can work with you on both consulting and training efficiency. We'll let you in on ALL of our Agile and Scrum secrets! You see, we don’t believe in hooking you on our consulting or training services. We figure you’re smart, and want to get help, or learn how. And in that process, we don’t hold back. We’ll use our advanced skills and experience on your behalf, and teach you everything that we know. We don’t try to milk your project for all it’s worth, adding billable hours you don’t need. We know you want to move forward. And fast. And continue your momentum. So we share all of our tips, techniques, and business-building IT secrets with you. Because we think that’s the right way to do business. We’ll help you quicken your pace so you can keep up and overtake your competitors. Agile: Want to get with the program? You want to bring your new products or services to market. You want to meet marketplace demand. You want to seize the opportunity before competitors step in. We help you to reach your goal faster & better. …and we’ll customize this and all our Agile services to your needs. As a proactive Leader you may be aiming at transforming your entire organization to be ready for the future, and gain the trust of your customers by serving them better & faster. We can be catalysts in morphing your entire team’s spirit with agility. 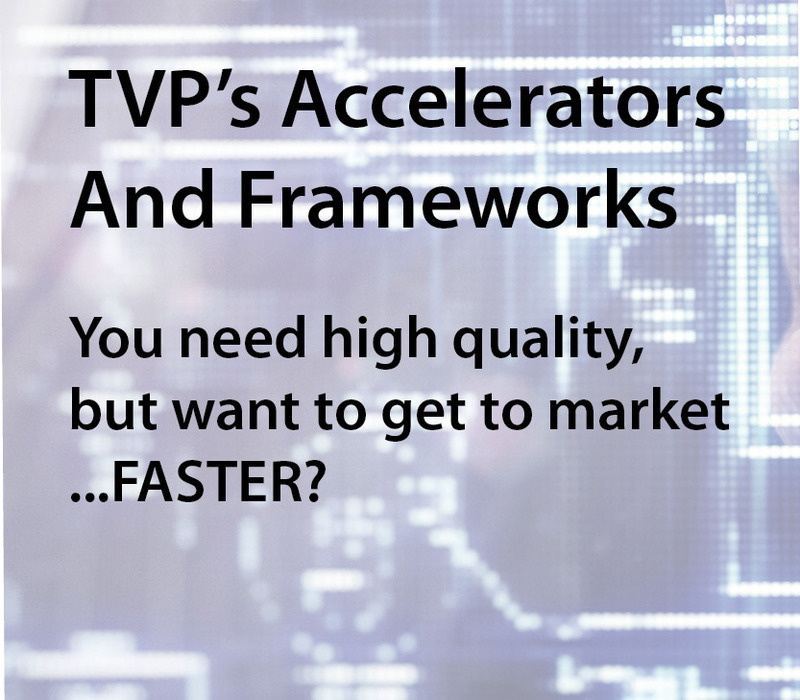 Another of TechVelocity Partners’ sweet spots is the smart application of processes — and we think DSDM is remarkable hybrid model of the Agile project delivery framework. It’s one of the key tools we make available to our clients. Many executives and managers appreciate “human” aspect of this approach, because beyond technology, it emphasizes the need for people to work together on an interpersonal level. So among the principles of DSDM (also known as DSDM Atern), are focusing on the business need…collaboration…to have firm foundation and yet build incrementally… incorporate clear and ongoing communications…and deliver on time, to enable early ROI. Two other key components of the hybrid nature of DSDM Atern, are that our experienced guides can help you take advantage of a “balance” of early planning — you don’t have to plan everything upfront, and you can still get started on the plan. And that work is prioritized around the MoSCoW. Model — Must, Should, Could, Won’t/Want. Some clients use it as a pathway to full scrum, others stick to this framework because of it’s unique mix of technology, human dynamics, and monitoring system. 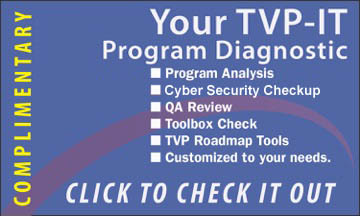 TVP offers this valuable management/efficiency hybrid approach to our software development and IT services, and brings DSDM training to large, medium, and growing client organizations. Now tell me...isn’t that all sound like a smarter IT trajectory? "You always teach with real life scenarios and connect with the Agile principles to make it more meaningful for the participants.... You have helped DS in building capability in Agile Methodology through your trainings and guidance to the managers to help them get certified." "I would like to take this opportunity to express my gratitude for working with you, as an Agile trainer and consultant to our organization." "You spent two full working days training our organization’s development team on Agile methodologies — while your assignment was just that, you voluntarily took it upon yourself to follow up and offer advice after the training. You have helped transform our organization from one that did not have any set development practices to one that is “successfully following the Agile methodology." More importantly, you have helped us become more efficient as a product development organization. What Makes TechVelocity’s Agile Support Different? We usually focus 40% on overall approach and put 60% on practical ..so you can jump right in, and learn how to use the Agile approach effectively. We can provide further value for your company, as our training helps prepare your teams for SCRUM testing and course completion / certification.